*Vacancy may vary, Reservation roster will be as per Central Government rules. not be considered for Walk­ in­ Interview. 3. No TA/ DA will be paid to the candidates for appearing for the interview. 4. 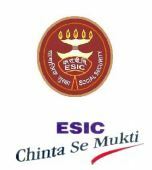 This advertisement has also been uploaded on website www.esic.nic.in. 5. The competent authority reserves the right to fill up of all or part or not to fill up any post.